Episodic photos from the third season episode of Shadowhunters, "City of Glass," airing 4/29/19, after the jump. 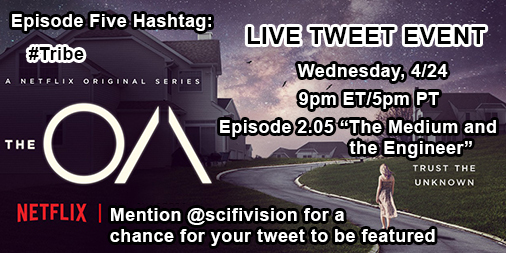 For episode five, we're once again coming together for a live tweet event for episode five, "The Medium and the Engineer". Please take note of the new weekly hashtag, #Tribe. You probably know the drill by now, but if you don't, read on. When a streaming service drops episodes of a series, it's hard for fans to know when to tweet; not everyone watches the whole season at the same time. Sometimes selected times are scheduled. SciFi Vision has decided to host its own fan events for the series. It would be great if you could join, but even if you can't, reposting would be very helpful to help spread the word. Not as many people knew about the first one, but since then, people have responded, and we have already received quite a few RSVPs. The event for the fifth episode will take place Wednesday, 4/24 at 9pm ET/5pm PT. A Twitter RSVP would be appreciated! Read on for the full instructions as well as what a live tweet is if you have never participated in one before. Replicas follows William Foster (Keanu Reeves), a neuroscientist working to transfer human consciousness into a computer and artificial body. He and his assistant, Ed Whittle (Thomas Middleditch) are close to a breakthrough when William and his family are in a car crash and his wife (Alice Eve) and their three children are killed. Thinking fast, William calls Ed to help him move the bodies to their lab so he can save and transfer their minds. Ed, who has been tinkering with cloning, might be able to grow them bodies. The problem is, there are only three cloning tanks. William must make the difficult choice what three family members to replicate and live with the consequences. Episodic photos from the fourth season episode of The Magicians, "No Better to be Safe Than Sorry," airing 4/17/19, after the jump. Episodic photos from the third season episode of Shadowhunters, "Aku Cinta Kamu," airing 4/22/19, after the jump. Today the comic book thriller Glass, written and directed by M. Night Shyamalan, comes to 4k Ultra HD, Blu-ray, DVD, and Digital. Glass is the third film in a trilogy that started almost twenty years ago with the release of Unbreakable, followed by the more recent Split years later. No one had any idea that the first two films were related until the credits were ready to roll on the second film, with a scene showing that both took place within the same universe, which sparked people’s excitement for more. In the first film, a comic book art dealer, Elijah Price (Samuel L. Jackson), a.k.a. Mr. Glass, is born with “brittle bones” disease, which causes him to be easily injured and suffer multiple breaks throughout his childhood. He feels that if he exists, he must have an opposite. He makes it his mission to find such a person, and eventually tracks down David Dunn (Bruce Willis), a lone survivor of a train crash that Price himself caused. Dunn subsequently finds himself to be super strong and nearly invincible, except for his weakness of water. Dunn becomes a super hero of sorts, a crime-fighting vigilante, The Overseer, helping the weak, as he also has the unique ability to see flashes of the criminal pasts and futures of others with only a touch. The only one aware of his abilities is his son, Joseph (Spencer Treat Clark). At the end of the film, Price is committed to a psychiatric facility. Jaime presents his case to Bran, Daenerys, and Sansa to answer for his mistakes; the gathered armies continue to prepare for battle against the White Walkers. Episodic photos from the eighth season episode of Game of Thrones, "A Knight of the Seven Kingdoms," airing 4/21/19, after the jump. Episodic photos from the eighth season episode of Game of Thrones, "Winterfell," airing 4/14/19, after the jump.